Tuscan Lakes, is built on the premise that the dream of a simpler life surrounded by the soothing beauty of the European countryside can be realized every day – not so far away. It takes the rich offerings of Tuscany, and places it within reach of every resident who wants to stop planning for “one day” and start living their dream today. Once turning off League City Parkway into Tuscan Lakes, residents transcend time and place as they drive past aqueducts as gracefully aged as their Italian models. Rolling hills and beautiful flowers fill the vast landscape of the 870 – acre masterfully planned, environmentally sensitive community. Home builders in Tuscan Lakes include Meritage Homes, Newmark Homes, Wilshire Homes, Coventry Homes and Masterpiece Custom Builders built between 2005 to 2010 and still building. Homes here range from 1800 square feet to 4500 square feet with lot sizes from 6000 square feet up to 15,000 square feet. The average market price of homes in 2009 ranged from $170,000 to $650,000. 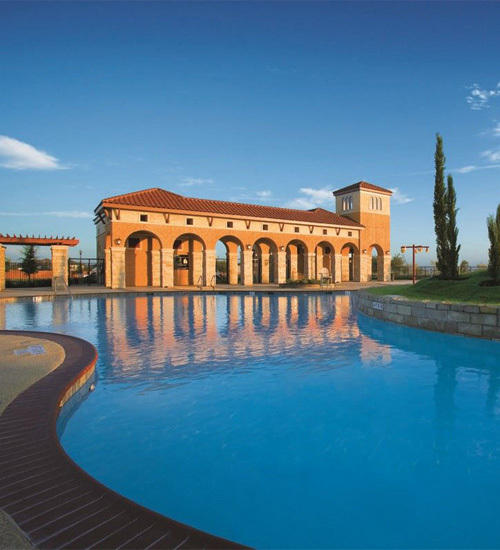 Rediscover your life at The Village at Tuscan Lakes in League City, located on Hwy 96 and I-45. The Village at Tuscan Lakes is a gated community with single-family homes for age-qualified 55+ adults, offering a resort setting. This lifestyle community offers nine floor plans ranging from 1500 to over 2600 square feet. The Village at Tuscan Lakes is ideally located near shopping centers, South Shore Harbour, Kemah Boardwalk, medical centers and Galveston Island. A 9,000 square foot recreation center will be the “hub of fun” in the community, where you will find a multitude of amenities for your active lifestyle. Get the latest on upcoming and existing properties around bay area and its surrounding communities.